In August of 1885, a powerful supernova erupted in our neighboring galaxy, Andromeda. Astronomers name supernovae by the year and order in which they exploded, and since no other supernovae went off in 1885 which were bright enough for us to observe, this event became known simply as SN 1885. No recorded spectra of the supernova exist, but the original observers — viewing the light through spectral filters — reported that no hydrogen lines were observed. Combined with records of its reddish hue, this has allowed the supernova to be retroactively categorized as Type Ia. As a supernova explodes, much of the star’s original mass is rapidly fused into heavy elements. This debris is ejected rapidly into the interstellar medium (ISM). The supernova’s material will be hotter, denser, and contain more heavy elements than the surrounding matter — thus, it forms a distinct structure known as a supernova remnant. Eventually, the blastwave will expand and sweep up so much of the surrounding gas that it slows itself down, like a projectile under air resistance. Yet the ISM is of such low density that it can take decades to centuries before this deceleration begins. The initial structure of the explosion should therefore be imprinted on the remnant throughout this first phase — known as free expansion — before the ISM mass begins to decelerate the expansion. SN 1885 is though to still be in the free expansion regime, so the authors of today’s paper hope the structure of the remnant should indicate what the original explosion was like. The authors of this paper obtained many ultraviolet observations of SN 1885’s remnant with the Hubble Space Telescope, with several filters chosen to view the absorption due to particular elements. They focus primarily on calcium and iron, which are elements abundantly produced in supernovae. In particular, they observe absorption by Ca II and Fe II, the species of calcium and iron with one electron stripped from the atom, as is common in the hot remnant environment. Fig. 2 shows the high-resolution maps of the supernova remnant, as observed in absorption by these two elements. Calcium appears to be fairly symmetric overall. Iron, however, is much clumpier, showing the structure of four distinct streams. 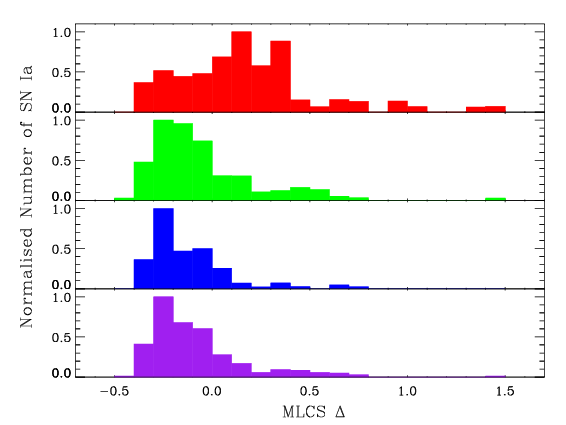 The authors believe this result should provide valuable information about the ignition process of Type Ia supernovae. The consensus view of Type Ia supernovae theorizes that the supernova progenitor is a white dwarf which has surpassed the Chandrasekhar mass. Essentially, the object has become so massive that its gravity overpowers the atomic forces and the white dwarf collapses. This could happen through the slow accumulation of matter from a large companion star (“single degenerate” model) or from two white dwarfs colliding and merging violently (“double degenerate” model). The two mechanisms are predicted to differ in the structure of the resulting supernova. The single degenerate process should result in a fairly symmetrical explosion. A double degenerate process should show a preferred axis of symmetry corresponding to the angular momentum axis of the merging white dwarfs. Despite the structure observed in the Fe II image, the authors conclude that SN 1885’s remnant indicates a single-degenerate formation scenario. 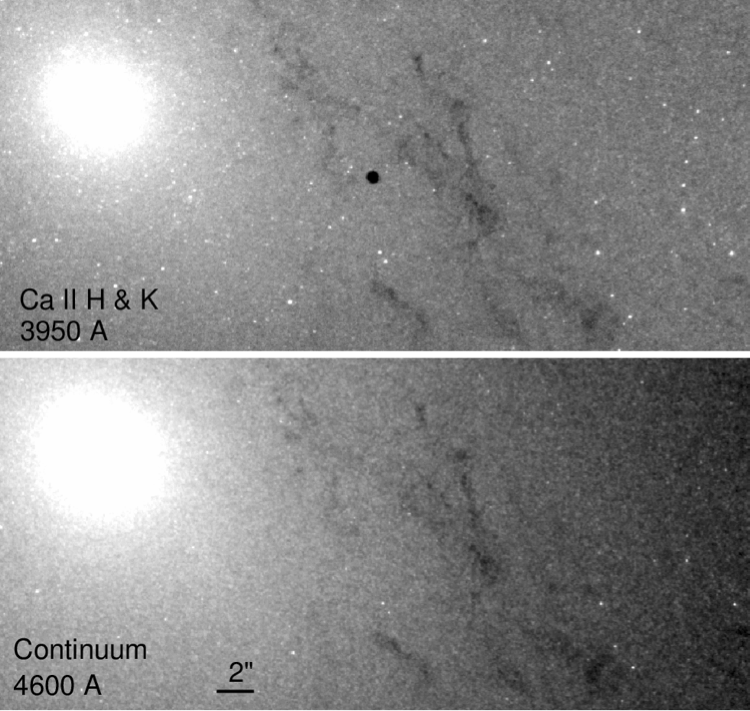 They argue that the calcium is too spherically symmetric to have resulted from a violent merger of two white dwarfs. They suggest the iron plumes could instead indicate the physics involved in the explosion itself. Particularly, the presence of the iron plumes gives constraints on the relative importance of detonation and deflagration. Type Ia supernova are used to determine the distance to far-away galaxies (and were tools in discovering the existence of dark energy). Therefore, it’s very important to understand the process by which they explode. Determining whether they form from single degenerate or double degenerate progenitors (or possibly from both) will help make Type Ia supernova better standardizable candles. Astronomers can address this issue with more observations (at similarly high resolution) of supernova remnants and their structure. I'm a second year astronomy grad student at Harvard and currently study the merger and accretion histories of galaxies in simulations. I'm also interested in data science, and how machine learning can be used in Astronomy. I received my bachelor's degree from Princeton, where my senior thesis investigated the distribution of baryons in a large range of dark matter halos. Just as Kepler uses planets to obscure a star’s light, why can’t you aim Hubble right at Andromeda’s core; use its ca and fe filters; and search for old supernovas?